Another Google app for Android has passed the 1 billion install threshold today. 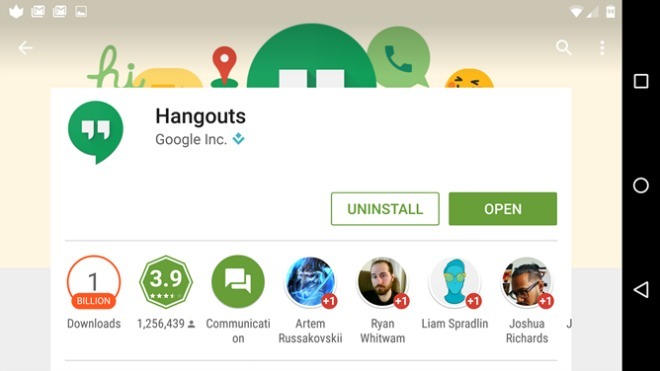 This time it’s Hangouts, following other apps such as Gmail. Apparently up until this point there have been only ten apps in this exclusive club, and only three of those aren’t made by Google. Interestingly, all three are made by Facebook – we’re talking about the social network’s main app, Messenger, as well as WhatsApp. The last two of those are direct competitors to Google’s Hangouts, and it definitely seems like they are a lot more successful right now. Hangouts is playing catch-up in the installs race, even though it’s been preinstalled on devices running Google services for a while now. On the other hand, when it comes to numbers of actual monthly users, we have nothing to report about Hangouts, but we wouldn’t be surprised if it was behind Facebook Messenger and WhatsApp, and by a lot.